Islip, Suffolk, Co. / Islip, Town of Islip, Suffold Co. / Bay Port, Town of Islip, Suffold Co. / Sayville, Town of Islip, Suffold Co.
A scarce example of Fredrick W. Beers' map of the Islip and Sayville, Long Island, New York. Published in 1873. Islip side covers from Babylon Cove and West Islip eastward past Bay Shore, Islip, young Point, Oakdale, Greenville to Sayville and Bayport. Includes parts of Oak Island and Fire Island. Notations to the right of the map proper offer business notices. On the verso, sheet is divided into three town plans. These include Islip, Sayville and Bayport. Detailed to the street and building level with notations on individual property owners. 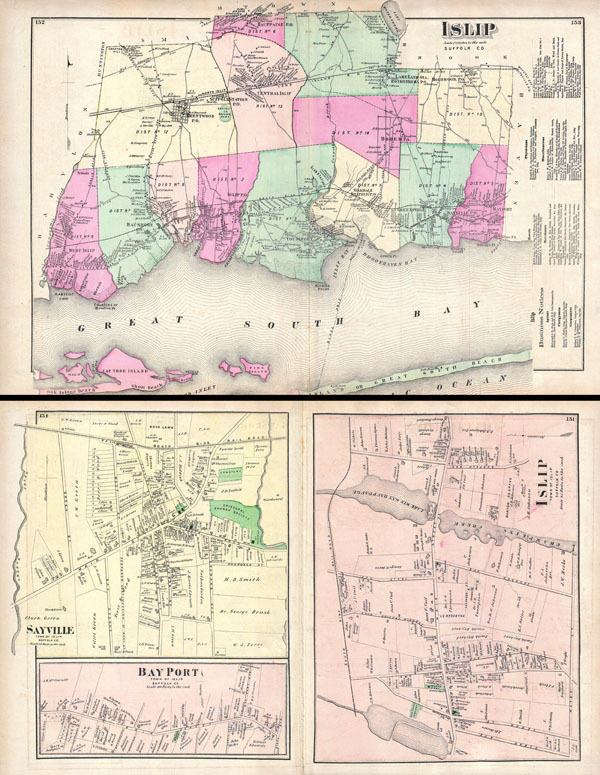 This is probably the finest atlas map of Islip and Sayville, Long Island, to appear in the 19th century. Prepared by Beers, Comstock & Cline out of their office at 36 Vesey Street, New York City, for inclusion in the first published atlas of Long Island, the 1873 issue of Atlas of Long Island, New York. Very good condition. Original centerfold. Islip map runs off edge of paper, as issued. Printed with maps on verso including Sayville and Bayport. New York Public Library, Map Division, 1527334, 1527333, 1527335.